Simple Mod Boho Pumpkin Designs to Decorate Your Fall! Fall is cozy. It’s the time we begin nesting at home, treating ourselves to warm apple cider and pumpkin spice lattes, fires, snuggling up with good books and honoring the change of seasons. One way to make your home feel seasonal is to add natural decor such as acorns, pumpkins, pinecones, fall pillows and warm candles. This year, we’re upgrading our fall decor to have a modern edge! Check out 6 DIY pumpkin carving and decorating ideas for your mod boho home. Get the stylish fall vibes your whole family will love! Everyone’s loving mud cloth these days! Native to Mali, these trendy textiles are adding pops of culture to our modern sofas. The designs are simple yet elegant. 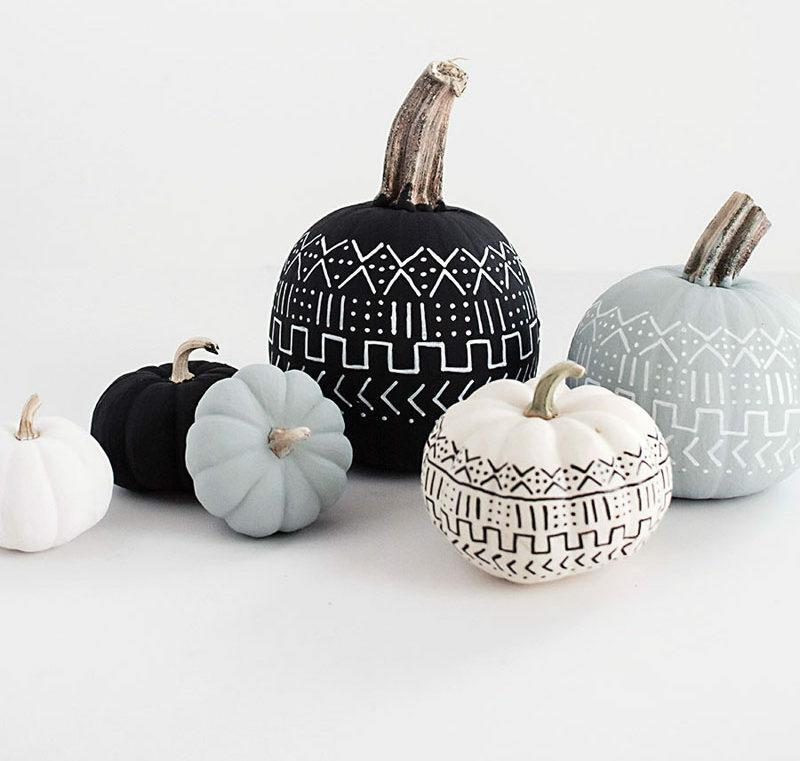 Get the deets on how to create DIY Mud Cloth Pumpkins on the Homey Oh My Blog! Saturated highlighter colors mixed with stark whites are are all the rage in trendy mod living. Adding a pop of bright to your halloween decor with this super simple tutorial on the Paper n Stitch Blog! These DIY fingerprint pumpkins are perfect for the no-carve lovers who want to play it safe with their little ones! Add some cute-ness to halloween with paint and personality! Head over to Handmade Charolette to get the step by step instructions! Elegant yet mystical. Create a universe with your family’s unique pumpkins! Of course Design Sponge came up with this magical craft. Typography pumpkins are sure to add a modern flair to your halloween decor! Find out how to transfer your text at the Studio DIY. DIY pumpkin lanterns! Love the mix of oranges and blues. This is a simple carve that takes a little patience but will be sure to make your fall feel cozy! Learn some tips and tricks on this design at Design Love Fest! Post a photo or link your favorite DIY tutorial! We’d love to hear from you! did you do these yourself? Hi Carolina! They’re an assortment of my favorite ideas 🙂 I tried the 1st one and loved it! Did you try any?